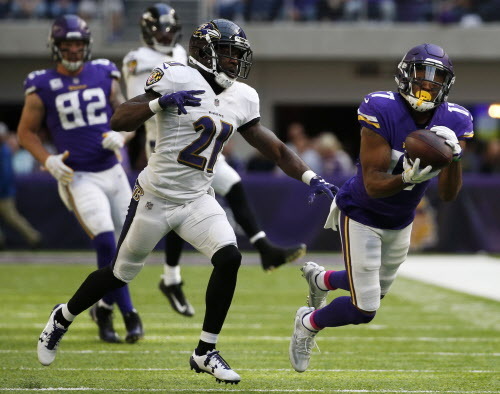 The Vikings have released veteran receiver Jarius Wright in a move that will help their salary cap situation and also allow the respected veteran time to find another team to play for, the team announced Friday. Wright’s contract was restructured going into the 2017 season. That dropped his base salary from $2.5 million to $1.05 million. He caught 18 passes for 198 yards and two touchdowns in 2017 and proved to be a dependable third option behind Adam Thielen and Stefon Diggs as Laquon Treadwell struggled to develop and Michael Floyd never became a threat in the offense. During the NFL combine last month, Spielman said that the team will be counting on Treadwell to take a significant step forward this season. That will be even more important in the absence of Wright, who joined the team in 2012 and leaves with 2,039 receiving yards. How will Vikings use their remaining salary cap space?